Many hardy geraniums will grow in a spot that is lightly shaded during the day, but there are a few geranium groups that are happy in a place that gets more shade than sun, such as beneath a canopy of shrubs and trees. All are easy to grow, provided the soil is right for them, and there are lots of different variations to choose from. Being plants for shady spots, these are the earliest hardy geraniums to bloom. Geranium macrorrhizum is a low growing, carpeting just about evergreen plant with amazingly smelly leaves. These are round, notched at the edges and slightly furry. When crushed the scent hits the back of the throat. It’s not unpleasant, just unusual and difficult to describe. When I say just about evergreen I mean some of the leaves remain over winter, with new ones springing into life during March. The flowers, which can be white, pale pink or magenta appear from May to June. They are held in clusters on short stems above the leaves. This plant really does not mind a dry soil in shade, and will create a dense carpet in a few years. They grow from about 15cm high (G. ‘White-ness’ with white flowers) to 40cm (G. ‘Ingerwersen’s Variety’ with pink flowers). 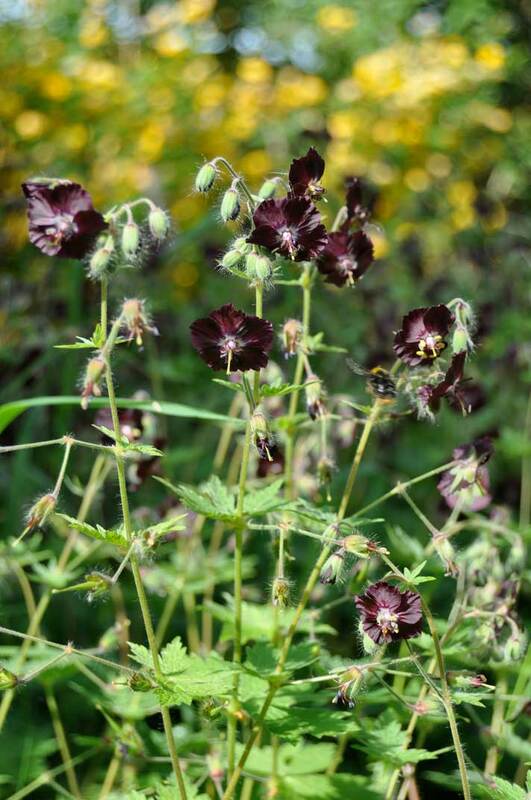 Geranium phaeum (Dusky cranesbill) is a more upright plant. The round, deeply notched leaves, form a dense, perfectly shaped mound from which upright stems, branched at the top, carry clusters of flat flowers from April until June. In the centre of each flower is a central spindle of stamens. The colours range from translucent white (G. phaeum ‘Album’) to very unusual, very dark maroon (G. phaeum) with shades of purple and lilac in between. One of the best of these is G. phaeum ‘Lily Lovell’. The leaves also vary in colour from soft spring green to mid green, while some are wonderfully patterned, such as G. phaeum ‘Samabor’ and G. phaeum ‘Springtime’. G. phaeums will happily grow with limited light, but they do need a soil that does not dry out. Geranium sylvaticum (Wood cranesbill) is as its common name suggests fine for growing under the dappled shade along the edges of trees. The deeply cut leaves form handsome mounds and produce upright stems that carry sprays of small flat flowers during May and June. In colour these range from purest white to shades of lilac and purple, and soft pink. 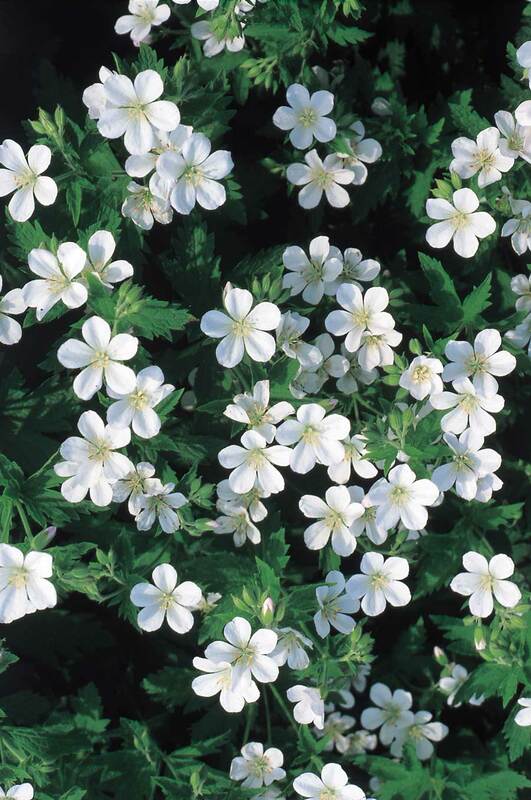 I consider Geranium sylvaticum ‘Album’ to be one of the best white varieties as it looks wonderful grown against a dark back ground (such as a tall hedge) - the white flowers positively glow. G. ‘Amy Doncaster’ has lovely purple flowers with white centres and ‘Mayflower’ and ‘Birch Lilac’ has soft lilac flowers. Again G. sylvaticum likes a soil that does not dry out. There are a few other geraniums worth mentioning for shady places. 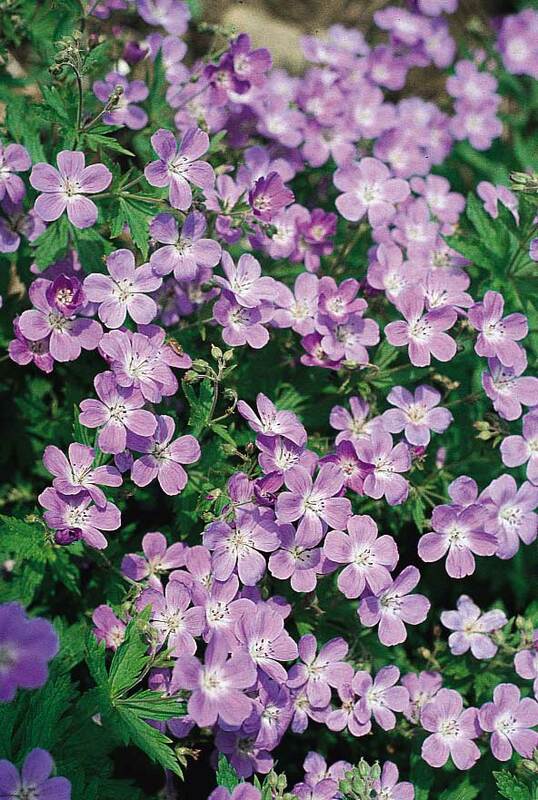 I remember seeing a carpet of Geranium nodosum under trees at Powis Castle many years ago (it could still be there). 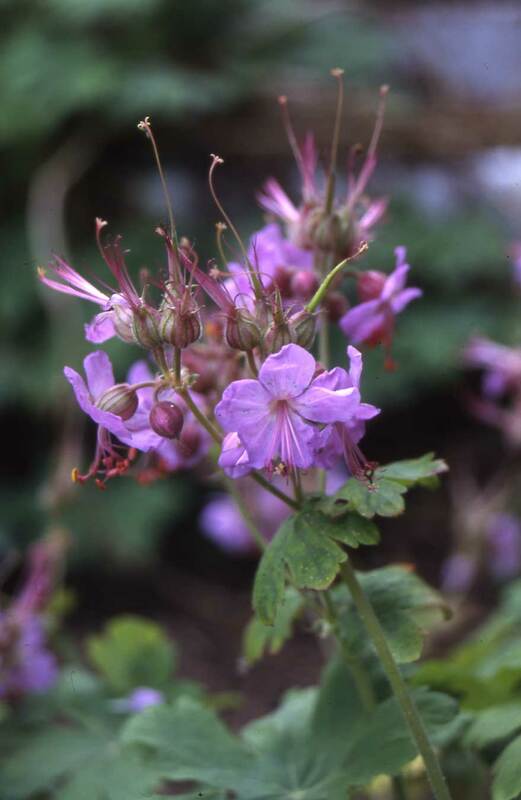 Geranium himalayense and its hybrids are okay in part shade, as is the famous Geranium ‘Johnson’s Blue’. All should be divided every three or four years to keep them vigorous, but beware if you want to keep G. phaeum true to colour remove the seed heads before they pop open or you will get a marvelous selection of crosses.